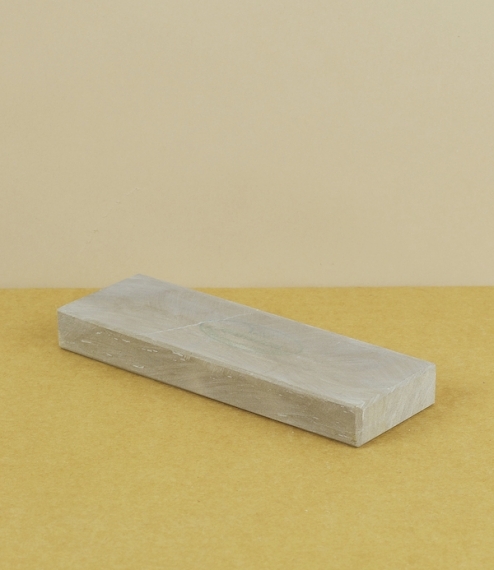 A fine (≈6000 grit) and fairly hard putty to blue-grey streaked natural hone cut from the even grained Rozsutec sandstone quarried in the Slovakian Mala-Fatra Mountains. Used with water these stones are ideal used regularly to refine the edge of well maintained knives and tools, or after a coarser stone for the restoration of duller blades. Best soaked for at least 10 minutes before use, and occasionally checked and lapped for flatness. About 150mm by just over 50mm by 21mm.